Less than one week after the National Equality March for Pride and Unity, 100 members of GMCW and our staff will board buses and head out on our first Southern Equality Tour. In the four days we are on the road we’ll travel through six states (North Carolina, South Carolina, Georgia, Alabama, Tennessee, and Virginia), singing at churches and LGBTQ Centers along the way. Among our many tour venues, we will sing at the Tennessee Valley Unitarian Church, a congregation still reeling from a shooting there several years ago when a man opened fire because of the church’s social liberalism. 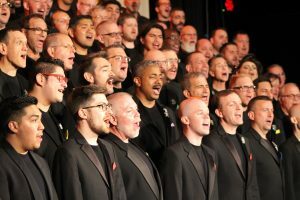 In Birmingham, Alabama, the Steel City Men’s Chorus will join us at the UUC Birmingham, which has a deep Civil Rights struggle connection—its congregation was deeply involved in and effected by the Civil Rights movement, and they continue to be social justice leaders. 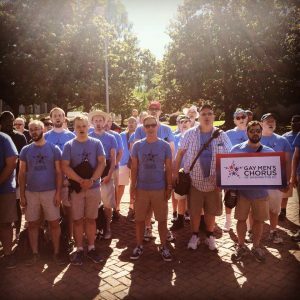 We will collaborate with the Midlands Men’s Chorus at Reformation Lutheran Church in Columbia, South Carolina to benefit the Harriet Hancock LGBT Center, and we will raise our voices with the Atlanta GMC at the Georgia State Capitol at the invitation of the office of Representative Karla Drenner, the first ever openly gay member of the Georgia General Assembly. We will appear at Knoxville Pride, side by side with the Knoxville GMC, and will give a benefit concert at the Diversity Center of Roanoke, Virginia. We are going to these locations to give our support, and encourage and thank folks for their social justice work. There will also be opportunities to sing in public parks and plazas. Here is where we might face opposition, perhaps even hearing hateful words. We will carry our GMCW banner proudly, wearing the GMCW logo on our shirts, and we will raise our voices for equality with confidence, knowing that love always wins. The tour is incredibly timely and relevant, particularly considering the religious freedom executive order recently signed by the President. We are taking this tour because the news of our being in town can make the difference for that bullied queer kid, or the student who is afraid to come out to his family. We are also taking this tour to stand up to those who are trying to move the clock back on the equality movement. We hope the news of our being in the South gets out, not just to those who need and want to hear us, but to those who don’t think they need or want to hear us. Maybe we’ll get the attention of a pastor at a conservative church, or maybe that one lyric will resonate in someone’s heart the way no other words have been able to thus far. Are there concerns about our safety? Not enough to stop us from taking this important journey. We anticipate opposition—that is why we are doing this. We may encounter protests or individuals who disagree with our mission. It may be uncomfortable. But we can’t move the needle unless we show up. We will sing to change hearts with our message of equality and justice for all people, and if we wiggle the needle just a bit and change just one heart, it will have all been worth it.